When showing your home, there are a few simple things you can do to cause your house to feel like home to your prospective buyers AND do so at minimal cost. Contrary to what you see on many TV programs, having candles burning throughout your home will often cause your buyer to think that perhaps you are trying to cover up an odor, especially from pets. Instead, drizzle a few drops of vanilla extract onto a piece of aluminum foil and place in your stove on low for 15 minutes to a half hour. Your entire home will smell like you’ve been baking bread for days! Have some spare time before they arrive? Keep a tub of cookie dough in your refrigerator and bake up a small batch, place on a china plate next to a pitcher of lemonade, iced tea or bottled water on your kitchen counter or table and offer your ‘guests’ a snack while you discuss your home. They are starting to feel at home. Another way to offer homey aromas is by setting out a glass bowl of lemons or granny smith apples on the kitchen or dining room table and a smattering of fresh flowers throughout your home. In the spring and summer, open your windows and let the fresh air waft all over while the breeze creates gentle waves of your curtains. Make sure and wash your windows and exterior doors so that as the sun is streaming through, they see the abundance of natural light and not the abundance of windows that they will need to be cleaning every spring. 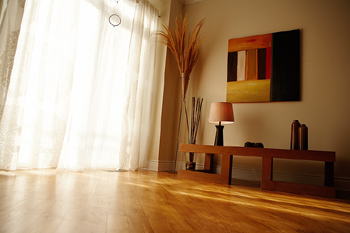 Dust furniture, polish hardwood floors & vacuum your carpets so they look freshly cleaned. Let them know how much you have loved and cared for this home. Give them a visual and aromatic experience that will cause them to want to make it their own!